This adventure is set in present times, but its story reaches back to the dawn of Christianity. 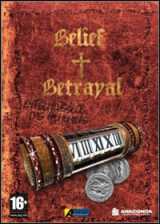 Secret orders, forbidden scripture, ancient secrets - Belief & Betrayal tackles subjects popular both among adventure games and current fiction. Players assume the role of journalist Jonathan Danter, whose investigation into the murder of his uncle sets him on the dangerous trail of a church conspiracy that leads back to the day Judas received a reward for his betrayal of Jesus. The player's travels will lead him from New York to London, Oxford, Venice and all the way to Rome. Ancient cathedrals with secret catacombs, gloomy libraries that stock books that should have been destroyed in the inquisition, mysterious monasteries in deep and dark woods – these are the elements used to construct this first-class adventure game. Slowly, he discovers a powerful conspiracy that reaches back through the centuries. It combines the thriller motives of church conspiracies and biblical secrets to form a beautiful, classic 3rd person point & click adventure game with innovative gameplay elements.